This antibody binds to human HMW-scuPA (54 kDa), HMW-tsuPA (52 kDa) and LMW-scuPA (33 kDa). 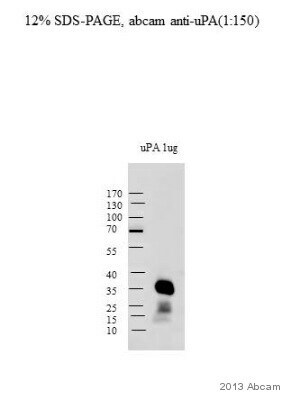 This antibody is highly specific for urokinase, no crossreactions were found with other serine proteases (tissue plasminogen activator, plasmin, trypsin, chymotrypsin, elastase, thrombin). Human whole plasma or plasma proteins do not interfere with its binding to urokinase. Full length protein (Human). Extensively purified native HMW-tcuPA and LMW-scuPA (mixture 50/50), isolated from human urine. This antibody gave a positive result when used in the following methanol fixed cell lines: DU145. Pooled antisera are passed over DEAE-cellulose to produce IgG-enriched fraction, which is subjected to absorption with immobilized total human serum proteins to remove non-specific antibodies. The affinity purified antibody is obtained by binding to immobilized native human urokinase, followed by elution with acidic buffer, neutralization, dialysis, dispensing and lyophilization. Our Abpromise guarantee covers the use of ab24121 in the following tested applications. WB Use at an assay dependent concentration. Predicted molecular weight: 49 kDa. ICC/IF image of ab24121 stained DU145 cells. The cells were 100% methanol fixed (5 min) and then incubated in 1%BSA / 10% normal goat serum / 0.3M glycine in 0.1% PBS-Tween for 1h to permeabilise the cells and block non-specific protein-protein interactions. The cells were then incubated with the antibody ab24121 at 5µg/ml overnight at +4°C. The secondary antibody (green) was DyLight® 488 goat anti- rabbit (ab96899) IgG (H+L) used at a 1/250 dilution for 1h. Alexa Fluor® 594 WGA was used to label plasma membranes (red) at a 1/200 dilution for 1h. DAPI was used to stain the cell nuclei (blue) at a concentration of 1.43µM. 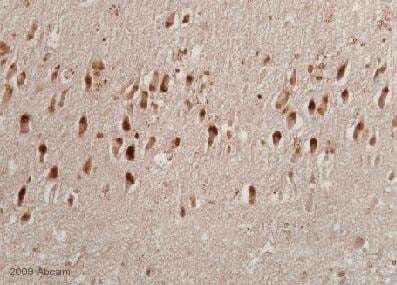 ab24121 at 1/200 dilution staining HMW-scuPA in human brain tissue by immunohistochemistry (formalin/PFA-fixed paraffin-embedded sections). Sections were formaldehyde fixed prior to blocking in 10% serum for 12 hours at room temperature and then incubated with ab24121, for 18 hours at 4°C. A goat monoclonal to rabbit Ig, diluted 1/50, was used as the secondary antibody. Publishing research using ab24121? Please let us know so that we can cite the reference in this datasheet.